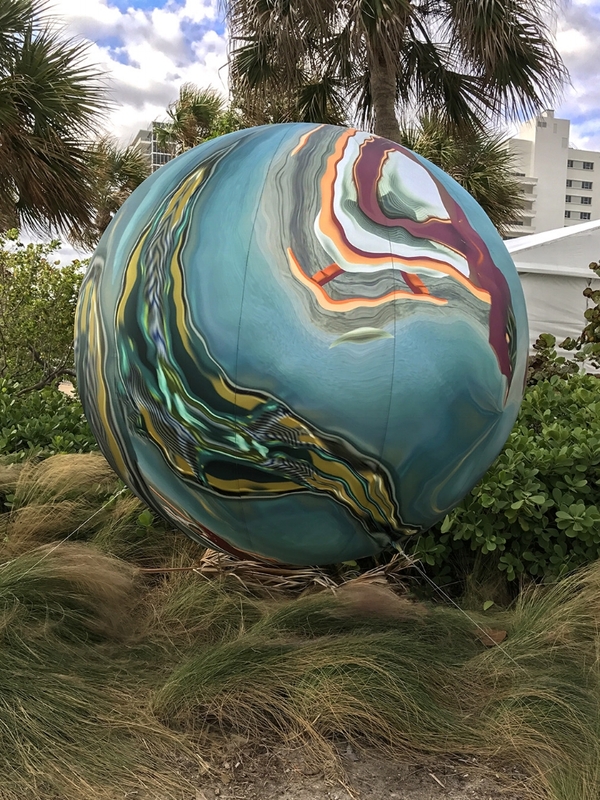 This year, PULSE Miami debuts its first PROJECTS Special Commission featuring digital artist, Anne Spalter and the installation of her Miami Marbles. Using photographs and video replicas of last year’s Miami Art Week, Spalter digitally alters and distills images of the city’s atmosphere, architecture and foliage to create contemporary landscapes. By abstracting Miami’s topography, Spalter encapsulates the vibrancy of the city within each of her expansive spheres. An augmented reality component will allow guests to engage with the orbs through an interactive interface. 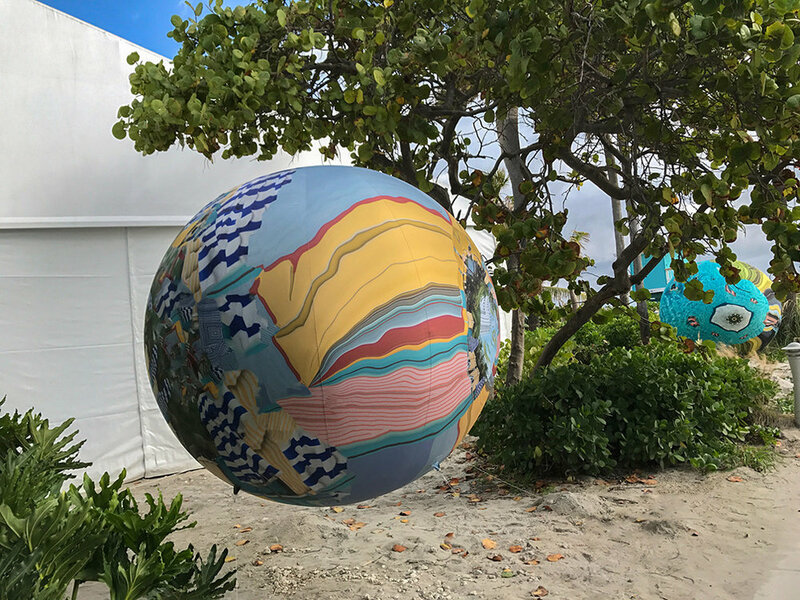 Viewers will be able to explore kaleidoscopic moving videos on the spheres and discover virtual orbs around the fair through the custom Marbles app. An extension of Anne Spalter's PROJECTS Special Commission will also be on view at the COMO Metropolitan Miami Beach Hotel. Anne Spalter, digital mixed-media artist, she is an academic pioneer who founded the original digital fine arts programs at Brown University and The Rhode Island School of Design. Spalter, who studied mathematics as a Brown undergraduate before receiving an MFA in painting from RISDI, has a longstanding goal of integrating art and technology. Her work is housed in the permanent collections of the Victoria and Albert Museum (London, UK); The Albright-Knox Museum (Buffalo, NY); the RISD Museum (Providence, RI); among others. Anne Spalter is currently part of the 2015/2016 Lumen Prize Global Exhibition Tour and sits on the board of the New York Foundation for the Arts. I present my work in a variety of formats—from video playing on a screen or projected to sculptural projects to augmented reality. You studied mathematics at Brown, in which way you mix your rational and scientific tools with art? I loved the way mathematics help gives order to the world. In my use of algorithmic patterning and kaleidoscopic imagery, I can combine the abstract geometric ordering of mathematical systems with representational imagery. What multi-sensorial does it means for you? My work is mostly visual but I do sometimes incorporate ambient sound. Your influences come from very different scenarios Buddhist art, pure mathematics, Futurism, and Action Painting, could you tell me more about these interests and in which way they touch your poetic? Mathematical, Buddhist, and Islamic influences all help me explore the spiritual power of art through the composition and ordering of space. I love technology so draw inspiration from the Futurist’s belief that new tools can help provide artists with new ways of thinking and communicating. My work is based on original footage and as with Action Painting the final works are just some instances of all the possible outcomes of source clips and computer manipulations. On the occasion of Pulse Miami Beach you inaugurate a large scale installation at the COMO Metropolitan Miami Beach Hotel, could you describe me this project? 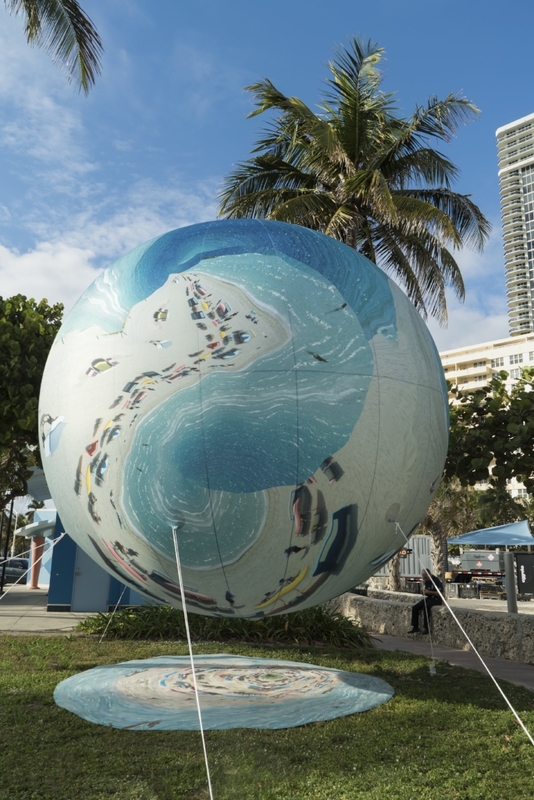 The Pulse Miami Marbles project uses imagery from my videos, printed on large-scale helium-filled spheres. As with all my work, the project started with original footage—this time from Miami Beach. I brought the imagery into Adobe After Effects and Photoshop and used these frameworks as well as custom plugins that I have for both software products. The spheres are quite large (from 2.1 meters to almost 5 meters in diameter). I had to rent a high-resolution camera (a medium-format digital back Hasselblad) and shoot images specifically for this project to create files large enough to print well at this scale. 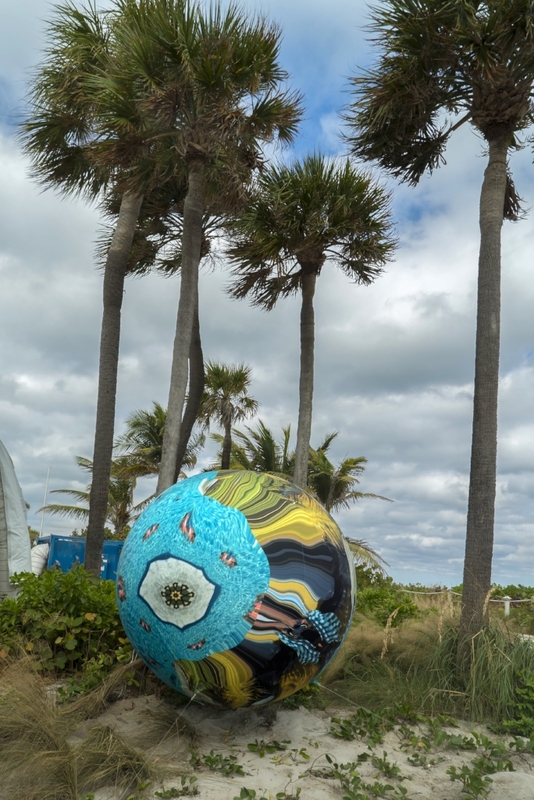 The spheres represent different aspects of Miami and Miami Beach—from the pools to the ocean and beyond. Each location became its own separate world of shapes and colors—inspiring the plantet-based naming. Anne Spalter Studios is in Brooklyn, NY. The ground elements under the spheres were created with Liora Manne (NY, NY); the spheres themselves were printed in Ontario, Canada (TMP International); and the app was created in Halifax, Canada, by Current Studios. I also spend time in RI and VT in the USA. I am writing from a hotel room in Miami so have to think about what images I can find for this. Will send later. The Museum of Modern Art in NYC. I just re-read the William Gibson Sprawl series (Neuromancer, Count Zero, and Mona Lisa Overdrive). I was amazed by how many things Gibson predicted and how much his work inspired aspects of many other books and films, from the Blade Runner to The Matrix to Inception and beyond –with concepts and terms such as Cyberspace and the matrix, and more. I also recently read Margaret Atwoods’ latest --“The Heart Goes Last,” and got to hear her speak the NY Public Library. I watched everything with Jason Statham in it during the Fall. But the last month or so it’s just been work, work, work. Love where I am living—Brooklyn, NY. I’d also love to return to Bora Bora, where I went on vacation a few years ago. I am inspired by great colorists, from Hans Hoffman to Bonnard; by eastern mandala art (The Rubin Museum in NYC has a wonderful collection), and recently have been loving what I feel is almost a movement of amazing female painters. Some examples: Rachel Schmidhofer, Elizabeth Glaessner, Kimia Ferdowsi Kline, and Amber Boardman.I worked on a collaboration last year with Leslie Thornton, an amazing filmmaker. Perhaps because my work is designed on the computer and uses patterns and symmetry, I always thought I would make great textiles. I have experimented with this—creating, scarves and clothing, as we as working with Liora Manne to create rugs, wall coverings, and pillows. You can see all this design work at http://www.kaleidadesign.com/.